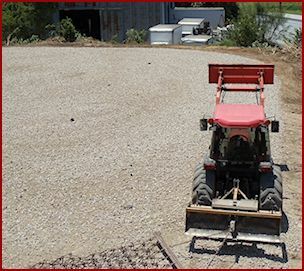 Call Precision for quality tractor and dirt working services in Harris and Montgomery County, Texas! ● Serving Greater Houston and surrounding counties. area is not on the list! Call Precision Tractor Service for fast, reasonably priced, dirt work and tractor-for-hire projects and contracts. Precision is available for projects in Houston and surrounding areas and counties of Texas. Whatever your needs, Precision Dirt Work can provide an affordable solution for you! Precision Dirt Work offers a variety of earthwork and earth moving services to commercial and residential customers. Getting a quote for your project is easy. Just call 281.935.7714 for an appointment. Leveling, grading and drainage problems can easily be resolved by our skilled operators. We can prepare your building and pad sites for construction, with complete bush hogging, lot clearing and final grade leveling services. Precision can design and lay rock, gravel and crushed concrete driveways complete with culverts installed as needed. Precision tractor services can assist with your fencing projects, by digging your post holes for just a few dollars more than you would expect to pay for post hole digger rental and to dig them yourself! Precision can do the entire job for you quickly, efficiently, and cost effectively. Finding reliable people to mow acreage can be difficult. But you have found the right team to take over! Precision will take care of your mowing year round. You set the schedule and forget about it. We do the rest. Call to set up an appointment for an estimate. Landscape design and construction Fence post hole digging - a few or hundreds! Our customers include homeowners, business property owners, rental property owners, property management companies, real estate brokers, homeowner associations, home builders, real estate developers, ranchers, farmers, and landscapers. No dirt or tractor project is considered too small or trivial to Precision. Calls and quote requests are welcomed from individuals with smaller one-day (or less) projects, to property investors and commercial interests. The people at Precision Dirt Work are committed to fast responses to calls and e-mails, as well as high availability to visit project sites for inspection and cost quotes. You can count on fast turn-around on project completion and quality workmanship.